If the folks at Ten Thirty One Productions can be given credit where it’s due, it must be said that they have dominated the Southern California pro haunt market in recent years when it comes to new and innovative attractions that go beyond the bounds of traditional haunted attractions. 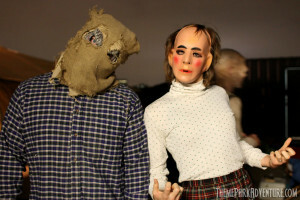 The Great Horror Campout is the latest notch in their belt, which made its debut this month on June 7th and 8th near downtown Los Angeles. Record needle scratch. Near downtown Los Angeles; say what? As strange as it certainly seemed at first (a horror campout with tents and wooded scare zones typically conjures images of the wilderness and secluded sites far from any metropolis), let me just say that despite the inevitable glimpses of the outside world encompassing the sprawling park where this event took place, reality faded with the sunset and once the event got underway, suspension of disbelief took over and the Great Horror Campout succeeded in becoming an immersive, fun, scary environment for its guests. Sunday, May 19th marked the final occurrence of TPA’s Spring Nights at Sam’s. In addition, last month’s gathering at Trader Sam’s at the Disneyland Hotel in Anaheim marked the end of the first year of monthly fan meets that we launched in 2012. Appropriately, it was also the largest single bunch we’ve ever had to date, with nearly 100 Theme Park Adventure fans and industry folks in attendance. For over a decade, Theme Park Adventure has hosted various gatherings at locations throughout the Southland; most of them were not very successful at all. Quite honestly, TPA had all but abandoned the idea of in-person gatherings after what we felt was a general lack of interest. Then, along came Trader Sam’s, a Tiki bar unlike we’d ever seen. On a personal level, we fell in love with the fun, quirky bar. 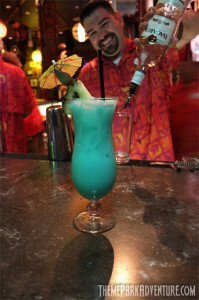 In the spring of 2012, we decided to give a fan gathering one more try, with Trader Sam’s the hosting location. People came from far and near, and the event was a success! Due to the growing popularity, Theme Park Adventure held a meet every month with the exception of October 2012, due to the fact that many of our attendees are active haunters and were busy during the season. We are announcing well in advance that TPA will be hosting a TPA Night gathering this coming October knowing that the group will be much smaller than normal, but also understanding that not all of our friends and fans are haunters and wish to still mix and mingle despite it being the Halloween season! Who knows? Maybe as part of this year’s October gathering, TPA will pay a visit to one of the local haunts for a special tour!